Insuring either of these subpopulations is really outside of the Affordable Care Act's control; Medicaid expansion is at the mercy of the remaining 19 GOP-controlled states which have refused to enact it (possibly 20 if newly-elected Kentucky governor Matt Bevin makes good on his threats to repeal expansion there), and the ACA has never allowed undocumented immigrants to enroll in private policies via the exchanges (or in Medicaid, although that's really up to the states if they want ot pay for it). Since I posted this piece, however, newer surveys/studies have come out which are more up to date and more comprehensive. The Gallup survey's biggest weakness is that they never include children under 18, so I've had to make certain adjustments, while the Medicaid Gap & Undocumented Immigrant data came from a year-old Kaiser Family Foundation study which is somewhat outdated now. Fortunately, the KFF recently released a new report, with data from this past spring, which brings the Gap and Immigrant numbers more up to date, while just this morning, the Center for Disease Control's National Health Interview Survey results (which run through June of 2015) were released...and unlike Gallup, the NHIS includes everyone in their reports, including children under 18. This gives me a more solid number to work with. Now, there are still some discrepancies. The KFF study claims that the total uninsured number is 32.3 million people...but their data is from "February, March, or April 2015". 2015 Open Enrollment ended in late February, and anyone who enrolled after January 15th didn't see their policies kick into effect until March 1st, so that's a good 2 million people who might have been only partly counted in the KFF survey, along with about 200K who enrolled via the #ACATaxTime special enrollment period who weren't counted at all (their policies didn't start until May 1st for the most part), plus a chunk of Medicaid enrollees from Indiana, Pennsylvania etc. which just launched expansion in earnest this year. The NHIS results (28.5 million total uninsured) run through June 2015, so they should be more recent and a bit more accurate than KFF's in terms of the total uninsured numbers. However, to be on the cautious side and for illustrative purposes only, let's split the difference at an even 30.0 million. Next up, let's look at the Medicaid Gap and Undocumented Immigrant numbers from Kaiser. Unlike the total uninsured number, both of these numbers have probably stayed pretty close to KFF's "early 2015" estimates because, by definition, these folks are still pretty much screwed. About 3.1 million people are still caught in the Medicaid Gap. Montana and Alaska have since expanded Medicaid, but Montana's doesn't even go into effect until January. Alaska expansion has only been operational since September, and they only have around 40,000 people eligible anyway...while Montana's expansion doesn't kick off until January. I'd say 3.1 million is still an accurate number for now. About 4.9 million of the uninsured are undocumented immigrants. Add them up and it's around 8 million...which means that 27% of the remaining uninsured (8 million out of 30 million total) are either in the Gap or Undocumented. This also means that if all 19 of the remaining states were to expand Medicaid (and everyone eligible were to sign up), the total uninsured rate would drop from 9.4% (around 30 million) to just 8.4% (around 26.9 million), give or take. In fact, while I'm at it, the KFF survey also claims that that as of last spring there were another 8.6 million uninsured people already eligible for Medicaid/CHIP (either via ACA expansion or "traditional" Medicaid) who haven't signed up for it yet. However, the CMS Medicaid reports from March and July show that around 1.4 million more people have since been added to the program since the KFF survey was conducted. 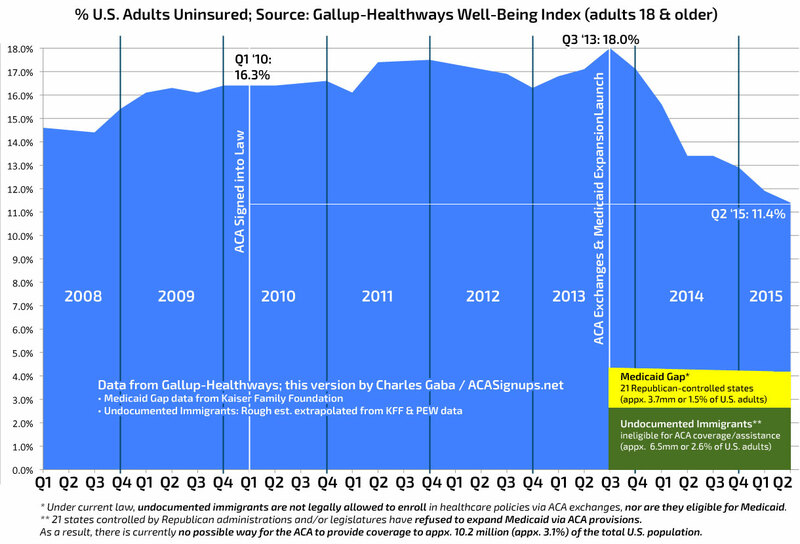 Let's assume that 1.0 million of these were previously uninsured (the rest being already-insured folks who fell on hard times). That knocks the "Medicaid eligible" tally down to around 7.6 million. If every one of them were to go ahead and enroll, the uninsured rate would plummet even further, to around 19.3 million (6.0%). The "handy" thing here is that whether you use KFF's 32.3 million, NHIS's 28.5 million or Gallup/Urban Institute/whoever else's surveys, the KFF's "3.1 million Medicaid Gap" number seems to be the accepted figure for that, and there's roughly 320 million people total in the U.S. this year. That means that regardless of which "total uninsured" number you use, it would be lopped down by 1 percentage point if the Medicaid Gap was wiped out.